The recent University of Pittsburgh Chancellor's Weekend Tour itinerary included a visit to WISER on Friday, February 6th. 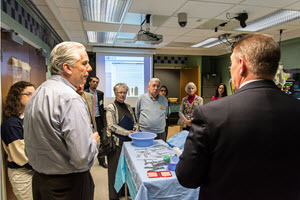 Chancellor Patrick Gallagher and a variety of University of Pittsburgh alumni and distinguished guests toured WISER to explore the innovative in simulation educational programming that our healthcare students and practicing professionals use every day. 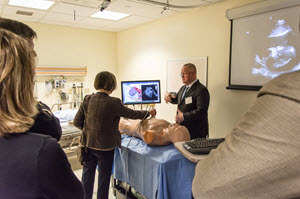 WISER's director, Dr. Paul Phrampus, gave an introductory presentation describing the use of simulation in healthcare and education as well as WISER's evolving role in the University and Health System. Following the presentation, the Chancellor and his guests were treated to a hands-on tour of WISER's facilities led by Dr. Phrampus, Associate Director Dr. John O�Donnell, and Visiting Fellow Dr. Andrew Musits. 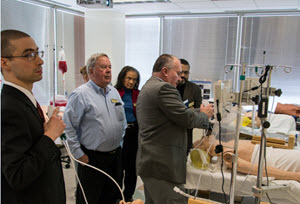 The tour allowed the guests to experience what a typical student or healthcare professional goes through on a daily basis as well as gain hands on experience with WISER�s simulation equipment.